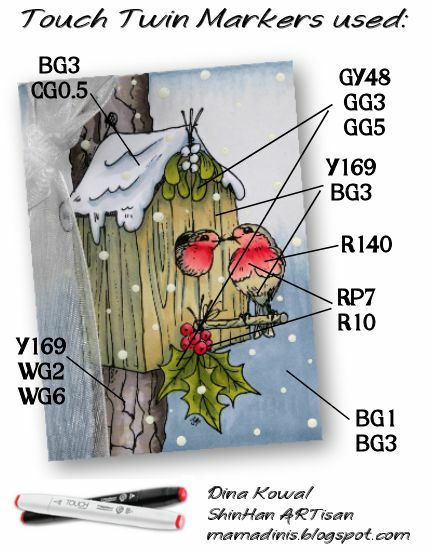 This weekend I'm hosting a challenge over at Splitcoaststampers for the December Virtual Stamping Night - VSN weekends are a fast-paced, fun time of quick cardmaking and chatter - a new challenge is posted hourly, and participants have 45 minutes to create their entry for each challenge. Lots of fun! This is one of my favorite entries, using a digital image (Kissing Robins) from Just Inklined. The inspiration was the song "Sleigh Ride" and I chose the line "...snuggled up together like two birds of a feather would be." I colored the image in with Touch Twin Markers (colors are below) and added some snow with acrylic paint, dotted with a large stylus. Have some stamping time this weekend? We'd love to have you jump in and join us! Another example of perfection from Dina.